The fact that older adults are more susceptible to slipping and falling should come as a surprise to no one. We’re all aware that, with age, our strength and balance decreases. As Sandra Martin further explains in The Globe and Mail, our bones and muscles become thinner and more prone to breaking. She goes on to report some startling findings of a 2016 report from the Alliance for a National Seniors Strategy. “In Canada, between 20 per cent and 30 per cent of people over the age of 65 fall annually, threatening their independence and general well-being and costing the health-care system an estimated $2.2-billion dollars in hospitalizations, surgeries, rehabilitation programs and other expenses,” the report reveals. Why are falls so likely to happen on stairs? Something that should also come as a surprise to no one is the fact that staircases are commonly locations for slips and falls. Naturally, stairs are designed for people to walk up and down, requiring some extra special attention to footing. As SeniorsMatter.com reminds us, stairs are obviously not flat surfaces and not all staircases are created equal. What steps should be taken to make safer staircases? It should probably go without saying that good, sturdy handrails are mandatory. Giving seniors something to hold on to is necessary to help them keep their balance on the stairs. 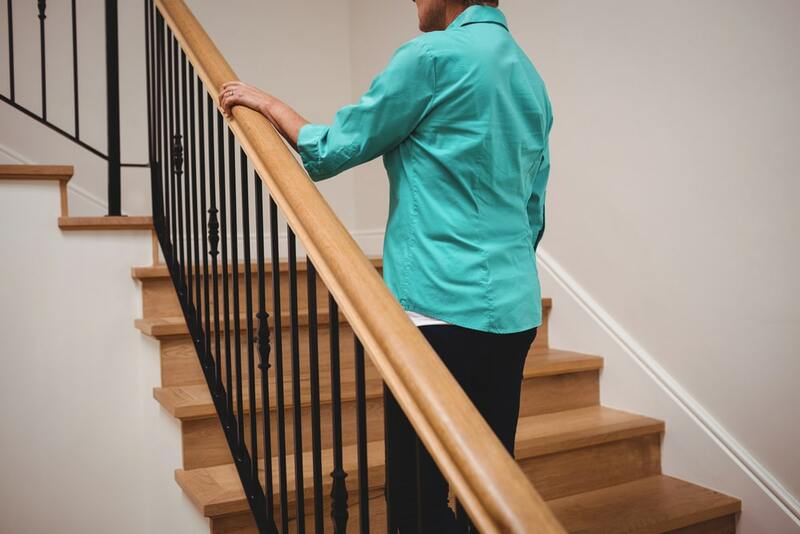 Be sure to have handrails that fit comfortably in your older adult’s hands. Bright lighting is also important. Being able to clearly see in front of you is a great way to avoid tripping hazards. Speaking of which, it’s vital to rid your staircase of anything that can be tripped over. Stair lifts provide the ultimate safety solution! At Advantage Home Health Solutions, we’re proud to offer an array of high-quality stair lifts which are guaranteed to eliminate slips and falls on the stairs. Stair lifts are motorized chairs that make it safe and easy to access multiple floors in your home, completely eliminating the need to deal with steps. They can be made to work with straight or curved staircases and can be adapted to suit your specific needs so you can continue your daily living routine and stay in your home longer. For more information about the stair lifts offered by Advantage Home Health Solutions, please don’t hesitate to give us a call at 403-460-5438. You may also email us by filling out the form on our Contact page!